With the Team Live Feed, you can see who your team is emailing, and whether their emails are opened, clicked, and downloaded. Here's what the Team Live Feed looks like. Click one of your Team names at the top of your Live Feed. 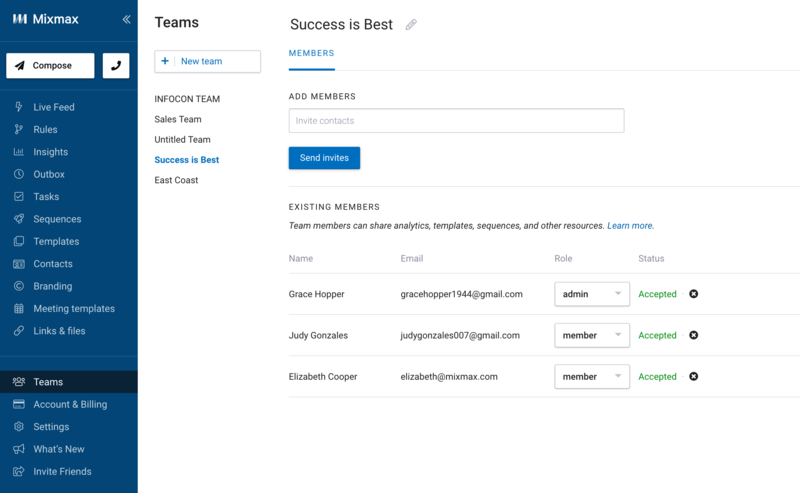 Inviting a team member: Each person will receive an email inviting them to join your team. When they accept, you'll see their status as Accepted. If they have not yet accepted, you can click Resend to send their invitation again. Inviting a team member who does not yet use Mixmax: If you invite someone who does not have a Mixmax account, they'll be invited to create a Mixmax account. Removing a team member: You can remove a team member at any time by clicking the X next to their name. Leaving a team: Team members you've invited can leave the team at any time — they'll see a button that says Leave this team. Disbanding a team: If you want to disband a team you created, first remove all of the teammates by clicking the X next to each person. Then click the X next to your name to disband the team. Who can contribute to the Team Live Feed? Note that while any Mixmax customer can see a Team Live Feed, only team members on the Small Business plan and above can contribute to the team Live Feed. Emails sent by team members on Free or Starter will not appear in the team's Live Feed. 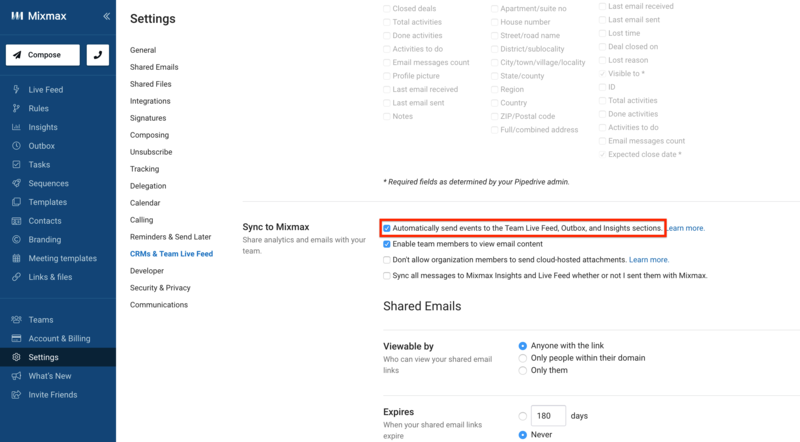 When you send an email, you can choose whether or not to sync the email to your Team Live Feed — hover over the Sync button, and click Sync to Mixmax in the bottom bar. You can log all emails to your Team Live Feed by default by going to the the CRMs & Team Live Feed section of your Settings. 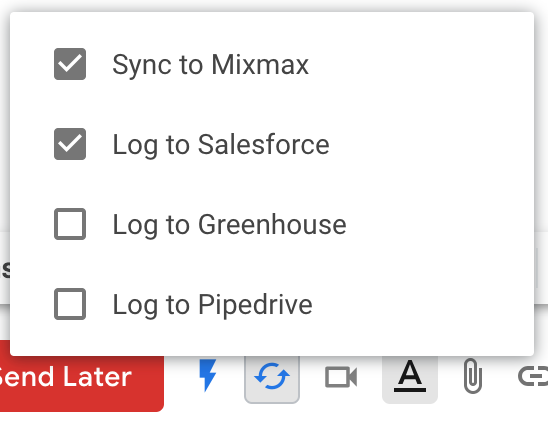 Scroll all the way down to the Sync to Mixmax section and click the box next to Automatically send events to the Team Live Feed, Outbox, and Insights sections.